Nos. 127 (left) and 129 (right) were built in 1897/8. Jackson’s Oxford Journal for 16 October 1897 (p. 6d) records that Kingerlee were to build new business premises and warehouses here, with a new passage to the Wheatsheaf in the middle. Both the old and the new building were in in the parish of All Saints until that church was deconsecrated in 1971. The number 128 was sometimes given to No. 127, sometimes to the Wheatsheaf, and sometimes to 129 next door. It is not used today, with the result that No. 127 is followed by No. 129. At the time of the 1911 census Frederick Allnatt (35) and his wife Emma (30) lived in the nine rooms over No. 127, where they ran a lodging house. Frederick Flight (63), a club steward, lived in the ten rooms over No. 129 with his wife Mary Ann, who ran a lodging house here, and their grandson. J. Sears & Co. Ltd. 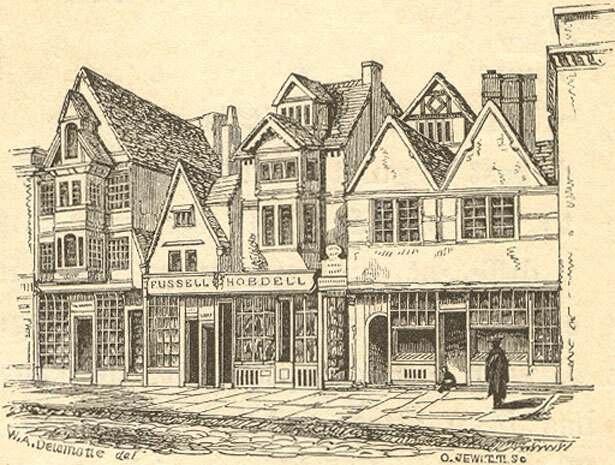 Above: Engraving by Orlando Jewitt showing the former shops at 127 and 129 in 1834. The shops are flanked by No. 126 to the left and 130 to the right looking the same as they do today. The original passage to the Wheatsheaf can be seen between Fussell and Hobday's shops. This shows the former building on this site five years before demolition, again sandwiched between Nos. 126 and 130. In the mid-seventeenth centurey Nos. 127–129 High Street were known as Swinbrook's and were leased to the mercer Thomas Dennis. In 1837 Henry Cooke the printer started to publish the Oxford City & County Chronicle (as the Oxford Chronicle and Berks & Bucks Gazette was first known) at the former shop here (see No. 119). 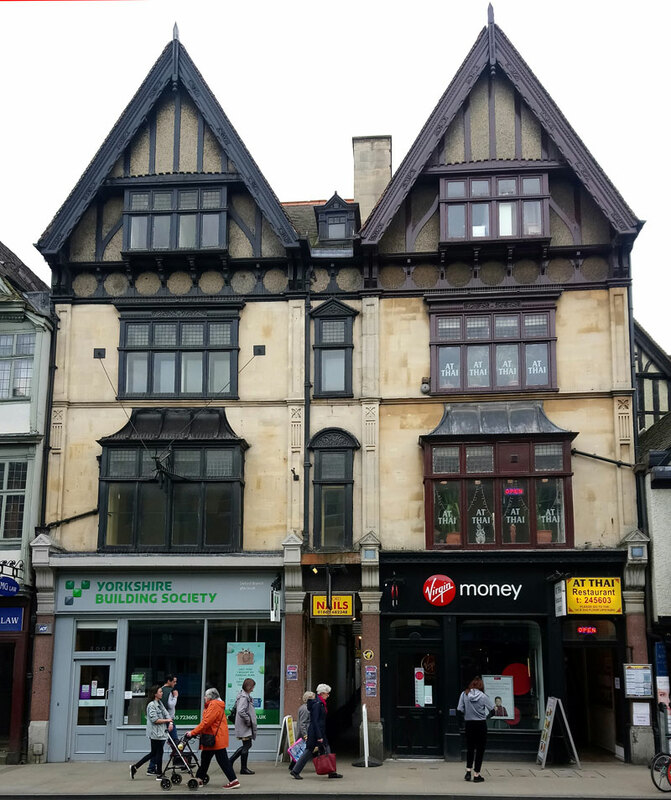 In 1851 the upstairs of the former shop on this site was occupied by the widow Emily Hobdell (48), described as a silversmith, and her daughter Lucy (7), plus two servants.